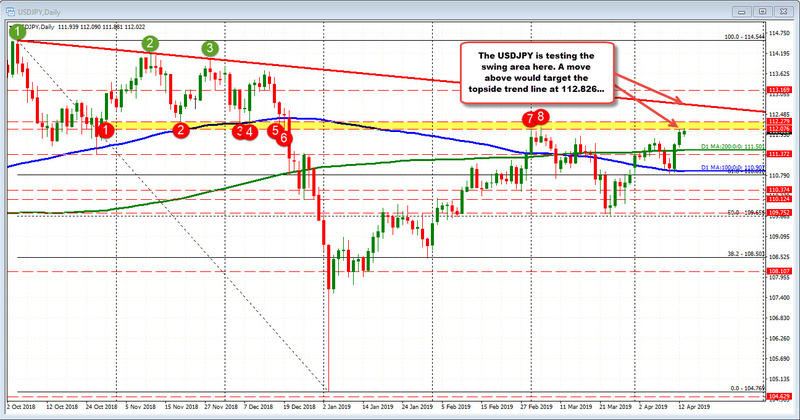 The USDJPY is trading toward the earlier day sessionn highs at 112.09. The price is moving higher after the better Empire manufacturing index and the comments from Fed's Evans. The range for the pair is still only 21 pips which is not saying much, but it does suggest there is room to roam as well (i.e. room for an extension). Looking at the hourly chart above, on Thursday and Friday of last week, the price trended higher and in the the process moved above the 111.79-817 swing highs from April 5th. The price has been able to stay above those levels today. That is a close risk/bias level for the short term. Stay above is more bullish. PS Also helping technically is that the move on Thursday, the price moved above the 100 and 200 hour MAs (blue and green lines around 111.45-48 today), AND the 200 day MA (at 111.50 currently). Those breaks were bullish and will also be key this week for the bullish or bearish bias. Looking at the daily chart below, what is slowing the upside a bit is that the pair is approaching a swing area from November and December in the 112.076-112.279 area (see red circles on the chart below). The pair tested that area in March and backed off. On Friday, the price extended to the low of that area and stalled as well. Getting above that area either today or this week would be more bullish.